My road to freedom hasn't been a quick one. Initially, I quit making the unhealthy choices, but I still had an unhealthy mindset. Over the last five or six years, God has done so much inside of me as I’ve allowed Him to peel back the layers and really set me free from all the stuff I tried to ignore for so long. I thought if I pretended it wasn’t there, I wouldn’t have to experience the pain it took to face it all and put it behind me. My journey has been a life-long process of giving over control of each part of my life to God, the One source of stability in my life, and the only One who truly can have control over everything. During my journey to forgive, and in times of stress or pain, I have been tempted to deal with things the way that I used to. God’s grace has prevented me from acting on those urges since 1994. It has taken me awhile to actually FEEL free. In the Summer of 2003, I realized that I was still holding onto a lot of the bitterness and negative thought patterns from the past. I spent a week sitting in the rocking chair with my Bible, begging God to heal my heart and set me free! I discovered that there were many steps in the healing process, and it was painful to evaluate the past and discover why I felt the way that I did. I had a couple of friends and mentors who prayed with me, counseled and encouraged me. I began to feel a joy and freedom I had never known before. 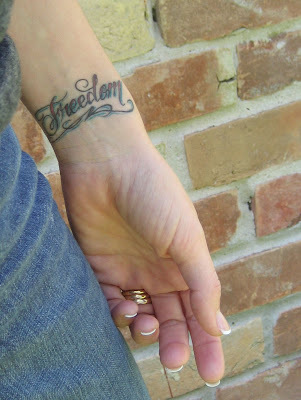 For the past few years, I have wanted a tattoo to symbolize my freedom. I felt that my wrist was the perfect place to remind me that I am no longer a slave to the sin that had me bound. Since Jesus set me free, the eating disorder doesn't hold me captive anymore. My chains are gone, and I am FREE! If you struggle with similar issues or addictions, please don’t continue on that devastating path. I encourage you to find a good counselor, pastor or friend and share your struggle with them. With God’s help and the help of others who care about you, you too can have the freedom that Jesus longs for you to have. Your story encourages me. I have a cross in the same place except the other arm. I got that to remind me of Jesus and what He did for me. It's a permanent piece of me that I cannot wash away. You are the first person who I feel thinks the same. Lots of people look at a tatoo there as "why would you get one there" I don't think they understand how powerful and meaningful that symbal is to us. I love mine. It is a part of me. It represents what I believe in. Yours is just beautiful. Thanks for opening up. I always think about you and miss you. Lots of love. *hugs* thanks for sharing your story.